If your job is a daily nightmare, this may be your chance to improve it. When your employer gives you the opportunity to fill out a job satisfaction survey, be sure to take it seriously. Even if you consider your job to be ideal, this is your chance to make it even better. If, on the other hand, there are parts about your job that you really dislike, this is your chance to work for change in a safe and structured manner. In either case, be sure to give your job satisfaction comments some thought before you write anything. Make a list of your most common complaints before you set to writing the job satisfaction comment. 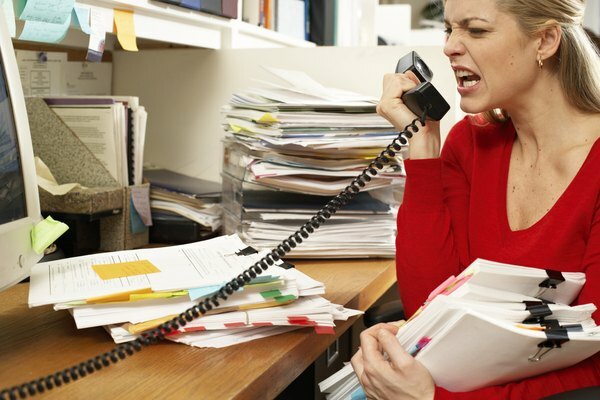 If you're a disgruntled employee, you may have a list of issues you want to deal with; for now, just get them all down on paper. Looking at the list of complaints can help you separate the petty from the serious, and help you figure out which ones are worth noting. Circle the complaints that you feel have a specific, measurable fix. According to a survey conducted by the National Business Research Institute, the six factors most affecting job satisfaction are stress, work standards, adequate leadership, fair rewards, the presence of challenging opportunities, and people having adequate authority to do their jobs. Another big factor, according to the Bradford University School of Management, is job security. Each of these problems could have a fix; managers can model better work-life balance and can discipline and reward employees more fairly; companies can try to offer more challenge and opportunity, and standards in the workplace can be improved if they're not currently adequate. Focus on those specific, measurable improvements when you write your comment. Try to stay away from finger-pointing or petty grievances. Instead, state the problem and then offer a possible solution. Avoid using slang or foul language, and try to be as succinct as possible. If your comments are very long-winded or rambling, you may not get your point across. Stay positive when you write your comments, and remember to include a dose of gratitude. Like any other person, bosses are more likely to respond to positive reinforcement and suggestions. If writing is not your strong suit, consider using bullet points or an outline format to write your job satisfaction comment. Bradford University School of Management: 10 Factors Creating Job Satisfaction: What Motivates Now? What Can Kill Camaraderie and Morale at a Workplace?